Living in Little Tunks, (no big tunks) a small town in the middle of nowehere can be hard. It is harder still when you are the Hardscrabble children, the kids that are treated as if they had a monstrous case of chicken pox. They live alone with their father, because their mother had mysteriously disappeared. Their father usually gives them a few weeks to warm up to the fact that he is going away, but this time, no. He packs their bags, and whisks them away to London to stay with their cousin Angela. But when these adventuresome kids run into the dead end of Angela being on vacation, they have to fend fro themselves on the dangerous streets of London. 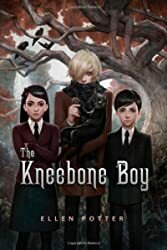 Ellen Potter delivers an awesome storyline, an incredibly discreet sense of humor (not a bad thing, a good thing) and some excellent characters in The Kneebone Boy. This was a great read! Ellen Potter’s website is here.